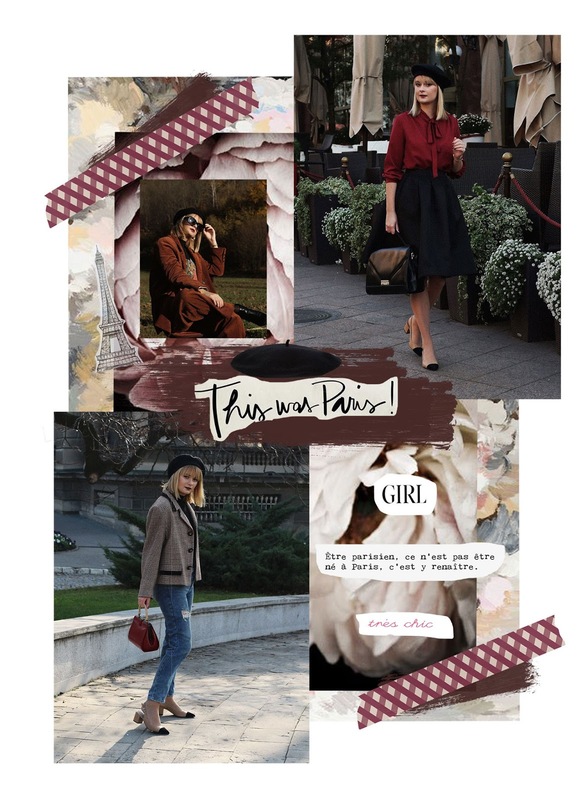 When you think of a beret first thing that crosses your mind are effortlessly chic Parisian girls! I'm glad that berets are back in the game. I never was a hat person and I was surprised how they fit me nicely! Hats tend to suit me weird because I have a big head. That's the reason I decided to write you a whole guide to how to wear a beret even if you aren't a hat person. I think that beret can fit perfectly to anyone only if you place it right. The first mistake I made wearing a beret was placing it on my head wrong and it looked like I have a plate on it. So, make sure to avoid to put it flat on your head. I found out that that's the Pancake style, which I'm not a big fan of. So make sure to turn it aside a bit and not to have sharp ends. I hope that makes sense to you. On the picture where I'm wearing a pleated skirt I did mess up a bit with the beret. You'll admit that it looks like I had a plate on my head. On the second picture, the beret is placed in a right way. I dragged it down over my ears. The last way to wear it is to drag it on the one side of your face. You can wear it in any way you want. I personally prefer the second one as I think it looks more cool and stylish! When it comes to combining beret with different styles, anything is possible. From everyday casual looks to classy ones. If you really want to spice it up, make sure to find a leather beret! It's edgy and it can be combined with formal looks as well! Scroll down to see how I combined it with so many different styles. I went with the black beret because it goes with everything and I don't need to think much about it. On the other hand, you can pick it in some other bright color match it with your coat, shoes or scarf. I think this is one of those accessories that make every outfit looks more sophisticated. But, at the same time when it gets cold, it's keeping you warm! I think this is going to be the first winter where I'll be wearing a hat! Let me know in the comments do you like to wear berets? What is your favorite way of wearing it? How To Stay Warm And Stylish During Winter? I think berets are adorable. So cute. Classic. Sophisticated. I love the red and black ensemble with it! You look so cute in that beret! I love your style choice and outfits too. You look so glamorous and sophisticated! You look so classy, polished, and well put together. The beret is adorable and I love that red top on you. That hat is so stinking cute! I wish I was trendy enough to pull off something like that! You make it look so good. A beret was never my fave because I could never pull it off well but I love how you rocked it . my best friend loves berets so much it's insane! but I can't pull them off at all, hahahaha! You do, I think that the way you style your hair makes the beret look even cooler! You were it well ... When worn right it looks so chic and stylish! Beret can be so elegant! I am french but I have never worn one. Funny, right? You style really well. All your outfits are on point, so chic and stylish! You look so classy with your berets. Berets are some of my favorite accessories. You style them really well! Your outfits are so cute! Thank you for the ideas on what a beret can go with. I never worn one before! Wow, you sure look really good with the berets, it fits you perfectly. I was never really into berets, infact the last time I wore it was when I was in high school. You make it look so beautiful, I think I would love to wear it again. I love this post and the photos. I used to love wearing berets when I was younger but I’d like you’ve read my mind as I was recently thinking about how to style a beret as I haven’t been too sure. Thanks for the advice as this was super useful, I can’t wait to try wearing berets again. Haha I love that post! True the first thing that comes to mind when you say beret is Parisian. Funny thing though, I am french I never wore one HA! But you look so fabulous on all your picture maybe I should try one ! Wow you look so beautiful in wearing berets. I'm not wearing berets, my fried do wear this and I love how your style. Such a great guide. You look so pretty. Berets look so sophisticated and classic, you have styled them so nicely and they perfectly compliment the outfit. You have made me to think about buying one. I have always wanted to get myself a beret but whenever I try it on, i can never get it to look good like that. It always seems to look good on others. You are looking so gorgeous in your outfits. I really the way you style a beret, and your silver boots looks so stunning. I really love it. the beret is a big statement piece and only the right person can wear it. You wear it well! I absolutely love reading your posts. You have such great style and you look great in everything you wear. I wish I could pull off a beret. Thanks for sharing. Ooh just in time for winter! And I JUST bought myself an awesome beret so thank you for the great ideas!